Working at Jim Henson Co, I have a special appreciation for this. Hopefully it won't get pulled. Enjoy. Here's the infamous drawing mentioned in the previous post. 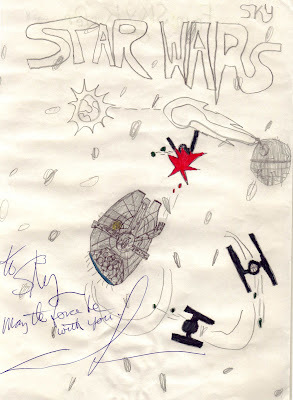 Not a great scan, but you can see all the details, including George's signature. A few of weeks ago, Chana and I went to the 2009 MPSE Awards show, and we came away winners in more ways than one.